Sample application letter for traveling allowance from company, office, manager or boss for visits, meetings. Letter for travelling allowance. Transportation Allowance Request Letter. I am writing to you because I would like to apply for some travel allowance. On the third of May i am traveling to the United States of America on a business trip. I would like that trip to be paid for by the company, the air plane ticket, taxis, hotel bookings food and drinks, as I cannot afford this on my pay role. As this is a trip that the company wants me to go on because I am the only person who knows about the topic of the conference this is your duty. I hope that you will grant me the travel allowance. I look forward to hearing back from you. Hope you are feeling good. I have been working here since 20XX that becomes four years and it’s the company rule to give travel allowance when your employees have worked three years. The purpose of writing this to request you to give me travelling allowance so I can go to abroad on a trip with my family. I will be very grateful to you. I will wait for your response. Thank you. 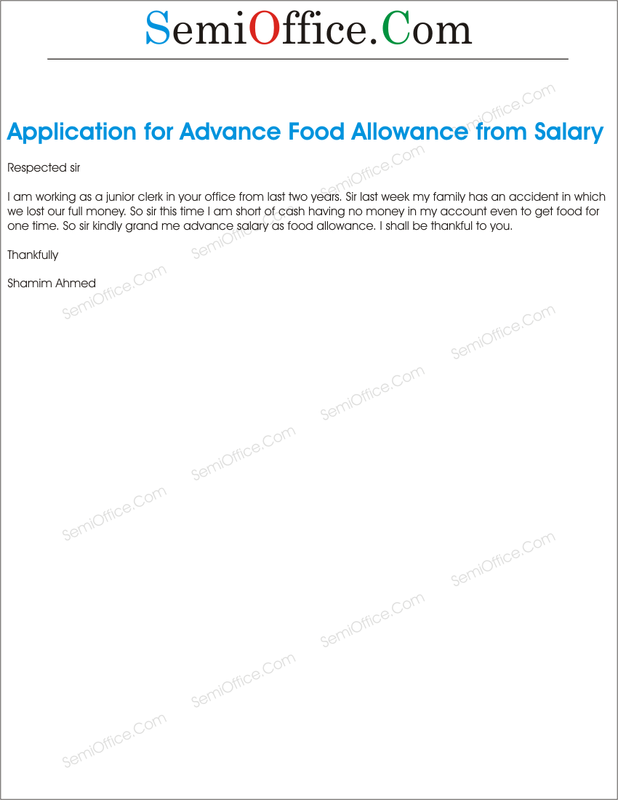 Sample application for advance salary as food allowance after accident, in emergency or shortage of cash, lost of cash and wallet. With due reverence, it is stated that I need food allowance in addition to my salary as with my current salary I am facing difficulties in meeting my food expenses. I belong to another city and I am living in a rented room to come for work. However, a major portion of my income is spent in rents and I am unable to maintain my healthy diet. It is not only affecting my personal lifestyle but also my work efficiency. It is therefore requested that an additional food allowance be granted, so that I can focus on my work without worrying about it. I shall be very thankful to you for this favor. Thank you in advance for this consideration. 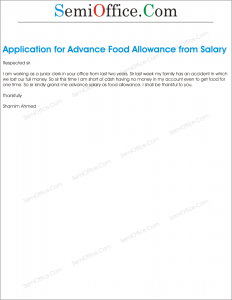 This application is to request a food allowance to the workers. Due to the location of factory and the atmosphere around it there are very less food points near the factory. Canteen can also not be made due to space issues within the work place. Considering these all situations I recommend a food allowance to all the workers of the plant. This would increase the motivation level in the workers. Sir, this is Kevin Ford and I am an employee in the taxation department at your firm. I was promoted last week to the post of Director Inspections which increased the number of visits that I go to each month. Although I receive the travel allowance which covers up most of my expenses. However, I have to eat at least 8 meals a week from the hotel. The allowance given to me is not sufficient therefore kindly provide me food allowance so that I am able to work without having any burden on myself. Thank you for your consideration. I am working as a junior clerk in your office from last two years. Sir last week my family has an accident in which we lost our full money. So sir this time I am short of cash having no money in my account even to get food for one time. So sir kindly grand me advance salary as food allowance. I shall be thankful to you. Sample Application for Marriage Allowance from company, office, factory, employer or job. Some companies with good repute also officer marriage allowance to their employees and salary increments after marriage. You can use this application as a sample for requesting marriage allowance. I am Ms. Khadija Anwar, working in your organization for almost two years as Senior Sales Consultant. I am writing this letter pleasingly to let you know that my marriage is going to be held on 27th may, 2015. As you know, I am the eldest among siblings, am orphan and have no other source of income to support me for my marriage expenses. Keeping in view the reasons, I want to request humbly to give me the marriage allowance as per the satisfied terms and conditions in the agreement of allowances, between the organization and me. I’d like to thank the management for the supporting policies for the employees. I am looking forward to have a consideration from you for my request. It is stated that I have been working at your firm as a “Senior Manager” since one year now. When I joined the office I was told by the CEO that whenever I am to get married, I will receive an allowance from the office which won’t be connected to my basic salary in any way. 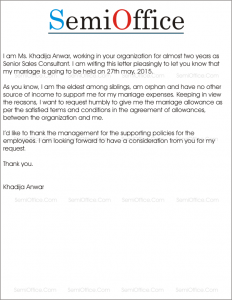 Sir, I am getting married next week and I would like to use my Marriage Allowance clause now. Kindly grant me an Allowance Cheque soon so, that I can cash it on time. Sample application for requesting fuel allowance form company. This application is written by the manager/supervisor for recommendation of fuel allowance of subordinates. This application is to request an increment in Fuel Allowance. I had been promoted to Senior Inventory manager from Assistant Manager last month. My duties have increased as now I have to supervise all the warehouses of the company, of which some of them are out of the town and some at distant places. These duties have increased my fuel consumption. So I request an increment in the fuel allowance, which is although mentioned in the perquisites of my job but had not been approved till now. 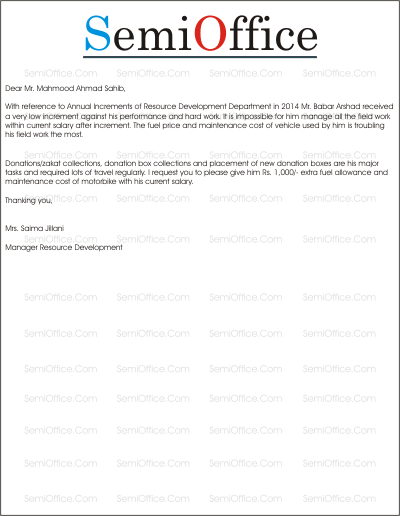 With reference to Annual Increments of Resource Development Department in 2014 Mr. Babar Arshad received a very low increment against his performance and hard work. It is impossible for him manage all the field work within current salary after increment. The fuel price and maintenance cost of vehicle used by him is troubling his field work the most. Donations/zakat collections, donation box collections and placement of new donation boxes are his major tasks and required lots of travel regularly. I request you to please give him Rs. 1,000/- extra fuel allowance and maintenance cost of motorbike with his current salary. Respected sir, I t is stated that I live almost 20 kilometers away from the office. As you know coming in the morning with all the fuss on the road is very hard, it’s being very difficult for me to afford this much worth car fuel. You may know that my basic salary is very limited so you can imagine how difficult it would be for me to manage the fuel and my household at the same. I request you to kindly grant me a fuel allowance increment so that I can come to the office on time and work efficiently without the stress of buying fuel for my car every day. Sample Application For Medical Allowance Issuance to company or department. For availing medical allowance you need to submit medical bills of on panel hospitals, pharmacies and doctors. I am Samiullah working as brand manager at AH Foundation, Lahore since 5 years. 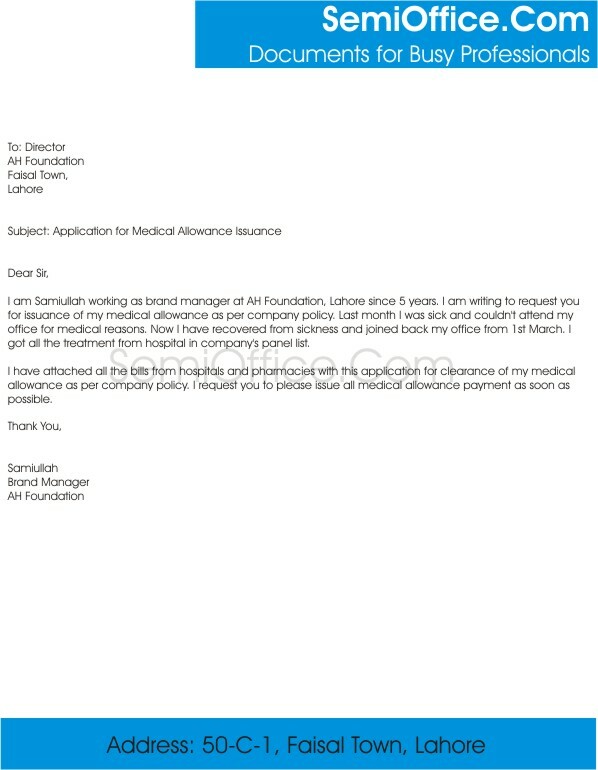 I am writing to request you for issuance of my medical allowance as per company policy. Last month I was sick and couldn’t attend my office for medical reasons. Now I have recovered from sickness and joined back my office from 1st March. I got all the treatment from hospital in company’s panel list. I have attached all the bills from hospitals and pharmacies with this application for clearance of my medical allowance as per company policy. I request you to please issue all medical allowance payment as soon as possible. It is stated that I am Ali Murtaza, working in your organization as a Customer Relation Officer, in ABC branch since last three years. I want you to permit me to drag your kind attention towards an issue of mine. The cause is, according to the policy of our organization medical allowance and fuel allowance are given to employees after their probationary period is over and they are directed towards permanent job and their designation. As per my appointment letter my medical allowance will be provided to me in case of serious emergencies. I want to inform you that I have experience a severe accident last week and have got a joint disorder. For about a month I will be on bed rest and won’t be able to move. I also have got serious injuries on face. In this condition of mine I am not able to join office until and unless I am perfectly alright as doctors have prescribed me complete stress free movement of my muscles, otherwise I might suffer from dreadful disorder. This time I am really in bad health and nature of my job is to meet people and contact them in person. My presence in this type of situation will not impart a good impression. My treatment is still going on, and all my medicines along with check ups are from organization’s panel. I want you to kindly release the medical allowance so that these payments can be cleared up as soon as possible. As per the policy of company, attached are the bills from hospital and laboratories where my testes were conducted. I assure you that I will join as soon as I will heal up. I shall be highly obliged for this favor of yours. It is stated that I had knee injury three months ago as a result of road accident. I undergone my treatment and partially recovered from pain. From the past one week, I was feeling pain again in my knee so I showed up to my doctor. After all medical checkups, I was advised to undergo a knee surgery in order to get permanent relief from the pain. I request you to requisite the amount of money I will have to spend on my treatment in the consent of medical allowance for employees. This Fuel Allowance Application Form is to request daily and monthly fuel expenses for the company. This form is available in ms excel and word formats. Excel form is available with auto calculation of rates and miles/km, but in word form you need to perform manual calculations. You should put all the required information like company name, month and your supervisor or manager’s name. You can download the attached fuel request form in excel and word.